Is BJP taking advantage of SC order on women's entry into Sabarimala? 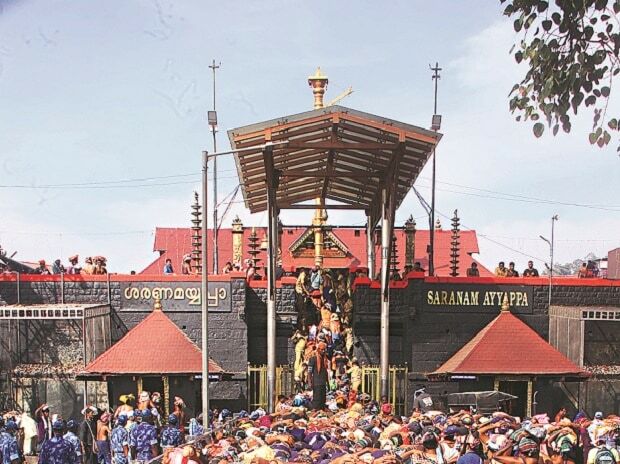 The Kerala Police on Monday installed mobile jammers near the Sabarimala temple to prevent the tantri and other shrine officials from interacting with the media and to dissuade live visuals. The move came as the state police contingent deployed some 2,300 personnel for temple security ahead of the special one-day pilgrimage that will start on Monday at 5 p.m. and end on Tuesday 10 p.m.
After 8 a.m. many devotees were seen protesting, shouting slogans as the police stopped them for checking en route to Sabarimala. Private vehicles carrying pilgrims were stopped. Starting late Sunday, a dozen women officers above the age of 50 have been posted in the temple town that had for a long time only witnessed police presence during the peak puja season. The state government is taking all necessary precaution to prevent any incidents like the massive protests it witnessed against the September 28 Supreme Court verdict allowing hitherto banned age group of girls and women to enter the Lord Ayyappa shrine. From October 17 to 22, when the temple was open for the monthly puja, the temple tantri and officials said they would close the shrine if any female devotee from the age group 10 to 50 tried to enter the sanctum sanctorum, as it was against the temple tradition. The Kerala government has announced it will implement the apex court ruling pitting it against the Bharatiya Janata Party (BJP) and numerous Hindu groups which have been up in arms against the verdict.